Vertex modeling. My favourite. I have to get used to several new names for functions but it goes better and better. Phil's video's are a good starting point indeed. Yet: I have a few questions. Now when you move it, it moves along the axis system. This is perpendicular on the sides. But I want to move diagonally, so I want to be able to rotate the axix system to the diagonals without rotating the object. Can you follow me? If not I can add an image. Is this feasible, eventually with a plugin? 2/ If I create two vertex objects, select them and then press G to group them, are they then really considered to have become one object? 3/ When I select something and I want to select more, but I press the Ctrl key, the objct moves in the axis system. I can get out of there by Ctrl clicking left of the scene, but what is exactly happening? Thanks for reading, and evt for replying. 1 ./ Select an edge of your oval,. and CTRL+Click it. this will change the "Working box" to align with that edge. VIEW menu / "Reset working box",... to get back to the default. 2 . / When you group objects in the Assembly room,. they are still separate object, but they're now contained in a group, they can still be edited individually. Is there then an option to join both into one object? Hi. Thanks 3dage for heling. if you want to add more to your selection just press shift (windows os) then click the object you want to add. - About joining objects...... I am not aware of a command in carrara that can does it. If you want to join two vertex objects, you can open the vertex modeller,. Ctrl+C, or Edit / Copy. to copy the object. then close the Vertex modeller,. That will give you One single "vertex object" which is actually two vertex models. You can make anything in the Vertex modeller, and that includes Multiple objects,. they're treated as "Single" Vertex objects in the Assembly room, but in the editor, you could have multiple different objects, or Polymeshes. If you were building something like a Watch model,. which has multiple parts, you'd build all of those parts in the vertex modeller. If you needed it to be animated,. you could edit that vertex model, Copy the parts that need to be animated. and create a New vertex model, and paste them in. Delete the old parts on the model,.. once you've created the New (moving parts) model. arrange them in the assembly room, (you could also "Group" them, so that they can be moved or animated together), and animate the moving parts. If you have an object which is made of multiple parts,. You can EDIT / Split Object. One thing that I like to use a LOT, is the Universal Manipulator. Let's have a look at the following image a second. The left-most arrow points at the Universal Manipulator. The right-most arrow points to the fact that I've changed the manipulation controls to "Selection". The center smaller arrow points to the tiny rotation handles on the Universal Manipulator. 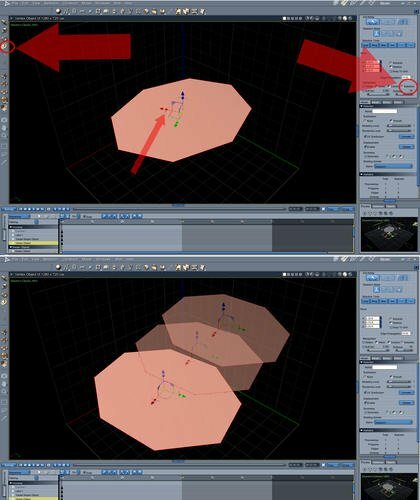 In Selection manipulation mode, I can rotate the mesh until one of the translation arrows points in the direction I wish to move the mesh, and then move the mesh along that trajectory. Then, if I need to, rotate the mesh back to a different angle. I have also adopted the use of the Universal Manipulator in scenes for the same reason. It has become a very handy method for me. So much so, that I just had to come in here and mention it with a picture. 1.Theres isn't any way to separately reorient the manipulator to a selection. The Universal manipulator should align to an edge orientation but it doesn't(possibly a VM bug or needs a feature request). As mentioned, the vertex modeler working box can be oriented to a selection('Send Working Box to Selection'), but the manipulator won't change to the new plane axis. In my experience, this feature is mainly used for creating new geometry at certain orientations or angles, rather than for manipulating existing selections. 2.You can convert groups to one vertex object and keep the spatial relationships. Select a 'Group' and export it as an .obj file, and then import it back in scene. And I learned some new tricks, and a limit. I'm not quite sure that's a bug though. The problem with the 'selection' mode and edges is that any single edge only has two points. Three dimensional direction requires that third dimension, or it falls to random fate, which is what happens here, I believe.